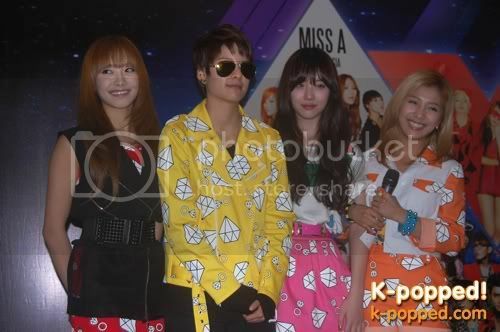 MO.A 2011 in KL: f(x) press conference · K-POPPED! This is your first time in Malaysia. What do you think of the country? Luna: It is our first time in Malaysia and there are many fans who welcomed us and I didn’t expect to see that. We really appreciate it and you will get to see more of f(x) in the show tonight. f(x) is getting more and more popular. What are your future plans? Victoria: We are very happy to see the results for Pinocchio and Hot Summer and we won’t stop here. Even though we are doing individual work, we will be coming together again next year for you. What makes f(x) different from any other Korean girl groups? Luna: Since our debut, we’ve never said we were like this or like that because we will always try to show you our versatility. Just like our name f(x), we will try our best to show you more variety. Choi Ji-woo’s latest drama in December 2008?